Where do people obtain family planning methods? A solid understanding of the choices and behaviours of users who select modern contraceptive methods is crucial to ensure universal access to acceptable, affordable and good-quality family planning services. In this step Dr Lenka Beňová provides an overview of the sources of modern contraceptive methods. The source of a family planning method is very closely related to the type of method used, and whether it is traditional or modern. The vast majority of traditional methods do not require a formal provider, with some exceptions such as folkloric methods, herbs and beads. 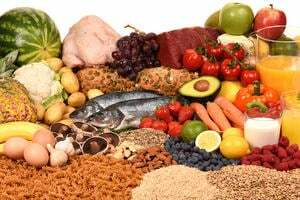 Modern methods, on the other hand, are commodities that need to be purchased or obtained, e.g. buying a packet of condoms from a pharmacy. Some modern methods require both a commodity and a certain level of clinical skill from a health worker, such as an implant insertion. How do we understand different sources of contraceptive provision? Due to the variety of methods available, examining where people obtain modern contraceptives needs to take into account the clinical nature of the different providers. A clinically-trained health worker based in a health centre can provide a wide range of contraceptives, spanning from condoms to IUDs and possibly even sterilisations. However, while condoms can be purchased without prescription from a roadside kiosk, this kiosk will not be able to provide clinical methods, such as injections or implants. 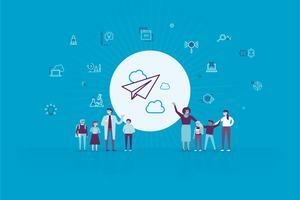 Is it a public or private sector provider? Public sector providers include locations such as government hospitals, government health centres, and public community health workers. Usually these providers are under the direct control of the Ministry of Health and may provide family planning services for free or for a reduced fee. On the other hand, private-sector providers operate outside of the governmental health system, and can include a variety of providers, such as for-profit hospitals, clinics and pharmacies, not-for-profit providers including non-governmental organisations and faith-based (mission/church/mosque) organisations, as well as non-medical sources such as general stores, vending machines and youth support clubs. Both public and private sector providers can span the range of clinical capabilities: from none to highly skilled. Understanding the relative importance of the various providers can bring useful insights for guiding development of strategies to reduce unmet need for family planning. Additionally, such understanding can lead to uncovering issues related to continuous contraceptive method availability and the cost of this provision, both to the health system as well as to the couples using the methods. What is the relative importance of the different sources of contraceptive provision? Recently, a large in-depth analysis of data from 57 low- and middle-income countries in four regions (Sub-Saharan Africa, North Africa/Middle East, Southeast Asia and Latin America & the Caribbean) examined where users of modern contraceptives obtained their current method. 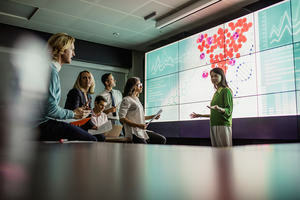 The data were collected in Demographic and Health Surveys, which are large-scale population surveys conducted in dozens of countries across the world. The majority (60%) obtained their method from a public sector provider, and around one third (35%) from a private sector provider. The share of private sector providers varied widely between countries, from a low of 6% in Rwanda to a high of 80% in Gabon. Women that were wealthier, more educated and living in urban areas were more likely to obtain their contraceptives from the private sector compared to poorer, less educated and rural women who were more likely to obtain their methods from public providers. Overall, public medical providers were the largest source of modern methods, and public non-medical sources (such as community-based health workers) made a surprisingly low contribution. 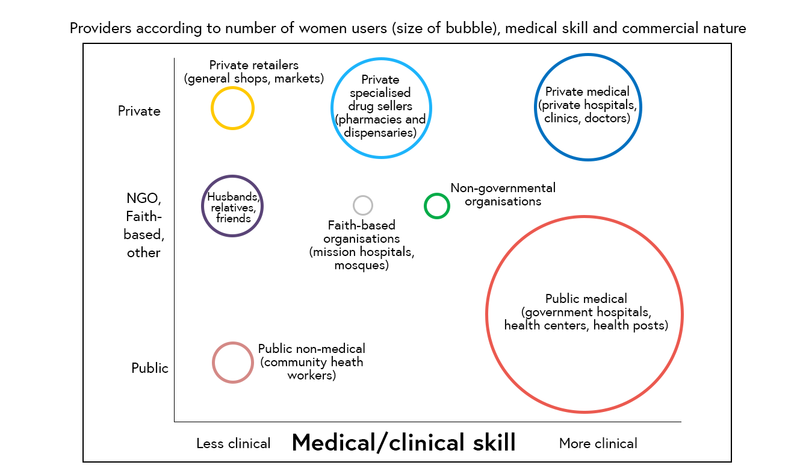 Within the private sector, women obtained contraceptives from three broad categories of providers. Among these, private specialised drug sellers and private medical providers were most important, and roughly equal in their contribution, with private retailers playing a smaller role. Non-governmental and faith-based organisations played a relatively small part in providing modern contraceptives. 4 in every 10 users of short-acting reversible methods, which require no clinical skills to provide, obtained their method from a private specialised drug seller. On the other hand, these providers played no role in giving long-term reversible or permanent methods. Medical providers (public medical and private medical combined) were used by 28% of women seeking short-acting reversible methods, but their contribution to the provision of long-acting reversible and permanent methods approached 100%. Method types: Short-acting reversible: male and female condoms, diaphragm, foam/jelly, oral contraceptive pills, emergency contraception. Injectables: Depo-Provera and other injectables. Long-acting reversible: implants, intrauterine devices. Permanent: female or male sterilization. How can method choice be better promoted? 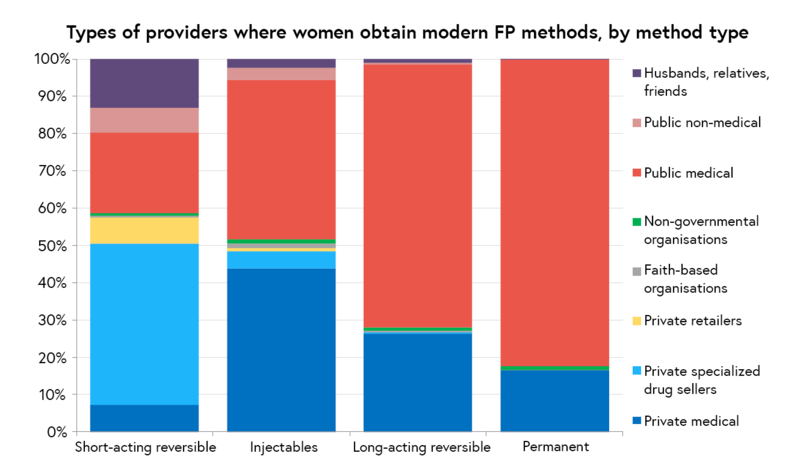 This brief overview of where women obtain modern contraceptive methods highlights the need for answers to important questions. Do women choose the method they want to use and then decide which provider is the most suitable to obtain this method from? Or, do they select a provider, considering the distance, waiting time, respectful care, and the price for the consultation and choose from the method options available there? 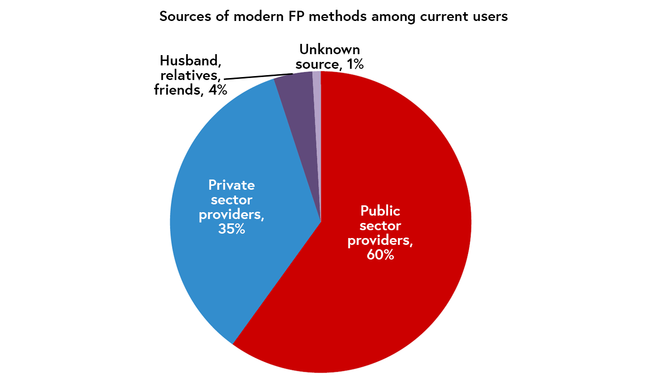 How do you think health systems in low- and middle-income countries can use existing family planning method providers to ensure that consistent, accessible, affordable and high-quality family planning services exist with a wide range of method options for all women, men and couples that seek to avoid pregnancy?